Earlier this month County Commissioner George Hanns, after discussions with County Administrator Craig Coffey, floated an odd idea. He wanted county government to absorb the tourism office, a private entity that’s currently part of the Flagler County Chamber of Commerce. The county contracts with the tourism office to manage the $1.5 million in revenue from Flagler’s 4 percent sales surtax, or bed tax, that’s levied on all hotel, motel and short-term rental transactions. The office’s mission is to markets the county and maximize tourists’ influx. If anything, Turner said, the tourism office is striving to move away from the chamber—to be an entity on its own, independent of either the chamber or the county, and that may happen at the end of the next—and presumably last—three-year contractual agreement the TDC is signing with the county next month. Those discussions took place this week in one-on-one meetings between Turner and four of the five commissioners (Barbara Revels was the exception). Hanns thought consolidating the tourism office with the county would save money, if it followed the same model as the county’s $500,000 economic development office, which also has a nine-member advisory board. But the consolidation would have inevitably raised issues of control, with the county—whose rivalry with Palm Coast at times influences policy—aiming to put a more pronounced imprint on the tourism office than the office might tolerate: just this year the office rebranded itself as “Palm Coast and the Flagler Beaches,” irking a segment of the county while amplifying Palm Coast’s voice (and presence) in its defining logo, though without altering the office’s strategy. “We’re always looking for ways to save money,” Hanns said, speaking of concern about staff stability at the five-person tourism office. “As of lately we’ve been having a lot of turnover with people going elsewhere, with people using it as a stepping stone, if you will. I just feel the benefits aren’t bad at the chamber but they’re not as good as a county employee, and since we’re paying them anyway I thought the same comparison would be like when we had Helga bring her operation into the county.” That’s Helga van Eckert, the director of economic development. She didn’t so much bring an operation into the county as the county started a new economic development office, hiring her to head it. By leaving the tourism office where it is, the county would be assuming $14,000 in annual rent that it would not otherwise pay if the tourism office was in a government building. In County Commission Chairman Nate McLaughlin’s estimation, consolidation would end up costing the county more, not less, than leaving the tourism office as a contractor. There’s been some turnover, but it hasn’t been the sort of turnover provoked by dissatisfaction or dissention in the ranks. This month the tourism office’s Casey Ryan, who was product development manager, became Palm Coast’s events coordinator, for a considerable raise: she was making $35,000 at the tourism office, she’s now making $52,400. She’ll still be working very closely with Turner and the tourism office. Jeanine Volpe, who’d been an administrative assistant since 2011 (at a $25,000 salary) chose to return to real estate, working for Coldwell Banker as the local housing industry appears to be revving up again. Amy Lukasik, the tourism marketing manager (at a salary of $41,200), and of course Turner ($65,000) are not going anywhere. (The budget the TDC approved earlier this week and that the county commission is slated to approve next week grants Turner and Lukasik a 3 percent raise.) Nor is Thomas Rominger, who works part-time at the Flagler Beach Historical Museum on the TDC’s dime ($8,000). TDC employees have their own benefits package, including health and dental. They just don’t have public employees’ membership in the Florida Retirement System. Most such tourism offices have become autonomous across the state, Turner said. But the autonomy is limited by dint of the tourism offices’ funding sources: the 4 percent bed tax remains a source of exclusively county revenue. Spending every dime of that revenue must be approved by the county commission, and overseen by the Tourist Development Council, the advisory body, with all transactions and proceedings falling under the transparency laws of the state. Judging by two measures—bed tax revenue and the number of visitors coming in—the office has done a good job: revenue is expected to be 7 percent higher when this fiscal year ends than it was last year. And a just-released survey for the tourism office by Mid-Florida Marketing and Research estimates that some 1.6 million visitors came through Flagler County in 2011-12. The survey may overstate the numbers: it’s based on phone surveys of just 1,020 people and a review of 8,000 records, and the researchers put their confidence level for their numbers at 89 percent, with some numbers proving quite surprising: the survey found that just 4 percent of visitors were from Canada, and 2 percent from the rest of the world, and that 76 percent of visitors—from anywhere—came to Flagler without children. Still, the survey provides a more empirical measure of visitors to the county than the tourism office has had in the past, Turner said. In her meetings with commissioners, Turner heard Ericksen’s sentiment echoed: the tourism office is not broken, so it doesn’t need fixing. But it may well migrate into its own entity next time contract talks are up. Get with the program – this era is about creating jobs! Consolidation would mean ‘downsizing’, getting more efficient. “cheaper, leaner, and cost efficient*!”. We don’t need that. We need bigger more expensive stuff. On the contrary, how about instead, consolidating the entire Visitor and Tourism Program to one state entity? That would then be, “cheaper, leaner, and cost efficient*”. * – cost efficient; synonymous with cheaper. 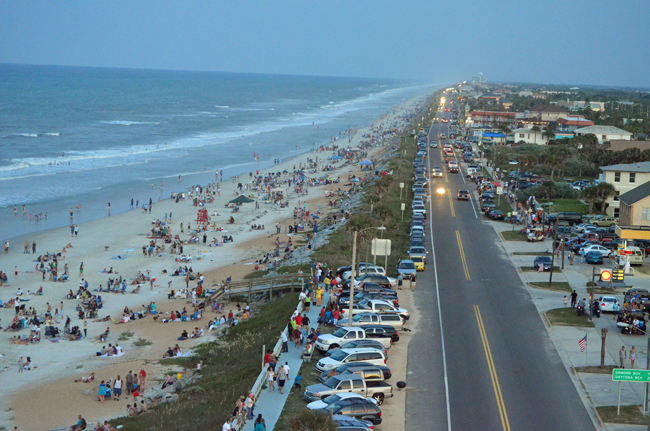 Palm Coast has already helped increase the number of Flagler Beach visitors. On my morning walks I see all of the new visitors. They started coming here right after Palm Coast started cracking down on the Pervert in the Park brigade. Seems like they found a new home down around the beach by the 7/11, where they have an excuse to wear Speedo’s. So who’s DRONE took this picture ? I thought they were not allowed in Flagler County. Now we have video camera’s along the intro-coastal waterway. Each day…more and more of your PRIVACY goes away. They won’t be happy until they CONTROL your whole life and your CHILDREN’S lives. I really am getting pissed off with the CONTROL FREAKS in this county !!!!! Barb, no need to go haywire. This picture was made possible thanks to the immense courtesy of the Flagler Beach Fire Department, and the equally great courtesy of Rob Creal. No drones, no spying. You might have gotten a hint of that by the copyright: it’s a FlaglerLive shot. I wish Mrs Coffey and Haans would float some new ideas about resigning. Geezzzzz! The county commissioners seem intent on consolidating even more power. . . under the guise of saving money. I suppose they think they can “sell” any idea if they “dress it up” by saying it saves money. Don’t they have enough to do. . . and shouldn’t they be more concerned about creating better results from their current responsibilities and endeavors? Why is anyone wasting time on this discussion? And the reasoning is ridiculous (i.e. they’ll get better benefits). I’ve heard Mr. Hanns speak about economics and business before and he really shouldn’t. He is very out-of-touch and his ideas are typically very narrow-minded. Looking for ways to save money? Why not look for ways to create a cash inflow. Start instituting parking meters all along the beach. It is understandable and acceptable and will greatly benefit Flagler Beach. Ron, don’t you mean ‘make’ money? It can’t be saved until it’s made. @ Ron: Meters at the beach is not a great idea because that will only force them to park in the neighborhoods and pretty soon everyone will have to have a sticker to prove they live here. Will be costly to monitor. You create a much bigger problem than you started with. From what I have seen in the growth of Flagler businesses, visitors are spending plenty of money when they are here. Isn’t that good enough? If they can’t park here, they won’t spend here.